ESP LTD EC-Black Metal Review – Fifty Shades of Black! With the EC-Black Metal, LTD takes ESP’s familiar Eclipse single-cutaway body shape, strips it down of any decoration, then blitzes it with an all-black, all-satin finish. Combined with minimal features and all-black hardware, there’s certainly a menacing look to this guitar – but one that is strangely attractive. This bold paintjob covers a solid mahogany body, making for a guitar that is comfortable to hold and to play. This is largely thanks to the satin-finished three-piece mahogany neck, featuring the classic Gibson 24.75” scale length and a fast thin-U profile. The fretboard is made from a dark Macassar ebony and features 24 extra jumbo frets, with string bending a cinch. In keeping with the stealthy theme, LTD snub fretboard inlays, although do include luminous side dots so you can see where you are. Ultimately, it’s only the metal LTD logo on the headstock that offers any decoration. Simplicity is the word of the day when it comes to the hardware too. Forget two or three pickups – the EC-Black Metal is stocked with just one humbucker. However, it’s certainly quality over quantity, with a Seymour Duncan ‘Blackened’ Black Winter bucker in the bridge position. This is a Californian-made pickup, with three large ceramic magnets and a custom overwound coil, so power comes easy. Meanwhile, controls are the very definition of minimalist, with just one single master volume knob on the lower bout. There’s also a set of locking LTD tuners on the headstock, complemented by a TonePros tune-o-matic bridge and tailpiece at the bottom, keeping this axe stable in its tuning. Finally, it’s fitted with a set of D’Addario strings, but doesn’t come with a case. With one pickup and one control, it may not be as versatile as other axes in this price range, although the EC-Black Metal does one thing very well – rock. Or, rather, melt-your-face rock. The Black Winter pickup offers the perfect tone for the most extreme brands of metal, whether industrial, black, speed, death or thrash. There’s a lot of power and aggression on offer, although this is controlled nicely, with a focused low-end and a nice crispness in the mids and trebles. For a passive humbucker, the articulation is excellent even with huge gain, while it retains a touch more warmth than an active pickup. Good fun for chugging rhythm and blistering lead play. You don’t have to be in a black metal band to enjoy the EC-Black Metal – and that says a lot about this simple guitar. Its tone is flexible enough for everything from punk rock to… well, the darkest of metal. It offers superb playability and killer looks that may actually draw more attention than something with an overly extroverted design. 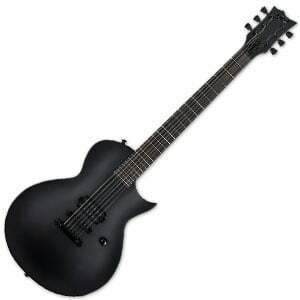 For more info about the ESP LTD EC-Black Metal, click here. For more electric guitars for metal, click here.